Auburn's Tre Mason, Alabama's T.J. Yeldon and Georgia's Todd Gurley will be among a deep group of contenders vying to keep Jameis Winston from a second Heisman. Jameis Winston has barely had time to come down from his Heisman Trophy win and already the question becomes, who’s next? 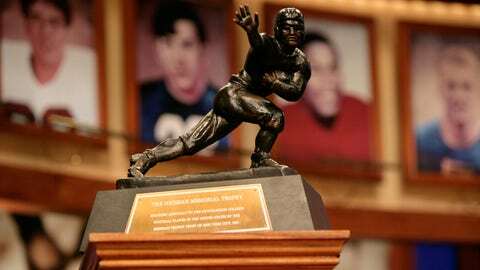 In 2014, the Florida State quarterback will be the ninth player to make a bid to join Archie Griffin, the only two-time recipient of the award. As history, — and most recently Johnny Manziel — has shown us, the degree of difficulty in claiming trophy No. 2 has only increased, with no one finishing higher than third since 1979. While Winston will now deal with a whole new set of expectations and dissection of his every mannerism, quip and who he’s paling around with, he’ll also be facing a class of contenders vying for the stiff-armed trophy. Here is a look at the players most likely to challenger Winston for next year’s Heisman, though keep in mind that the last two winners were both redshirt freshman, so there remains the chance that next year’s award goes to someone no one is talking about just yet. (*Denotes that player is eligible to enter the NFL draft but has yet to make an announcement. Johnny Manziel falls into that category, but he is, by all accounts, turning pro and is not included). He’s already said he’s coming back to Eugene for at least one more year and has the name recognition and the numbers to enter the season as the front-runner. The favorite at this season’s halfway mark, Mariota saw his chances — and the Ducks’ BCS title hopes — fall apart over the last four games. But he still ranked ninth in FBS with 332.8 yards of total offense per game and was eighth with 234 points responsible for. If anyone is going to bring the Pac-12 its first non-USC Heisman since Jim Plunkett in 1970, Mariota has the best chance. Miller’s NFL decision will come after the Orange Bowl, though Urban Meyer has voiced his opinion, saying the QB isn’t ready to make the leap. The belief is he follows his coach’s advice and comes back, allowing Miller to build off a season in which he’s shown growth as a passer with career-bests in completion percentage (63.2) and TD passes (22). The favorite last summer, Miller’s campaign was derailed by injury, but if healthy, he’ll be poised to end the Big Ten’s eight-year trophy drought. Dominated by big-name QBs in 2013, running backs will be the face of the SEC next season and Mason will headline the group after finishing sixth in the voting. While he ran for 1,621 yards and 22 TDs (both SEC-highs) in carrying the Tigers to the BCS title game, that came largely behind a strong finish as he ran for 868 yards in the last five games. He got off to a slow start surpassing 100 yards just once in the first five weeks. It’s going to take more consistency to claim the award, but if Mason is back in the fold on The Plains, opportunities won’t be a problem considering Gus Malzahn’s love affair with the run game. In 2009, the Tide had a first-year starting quarterback in Greg McElroy and the result was Mark Ingram winning the Heisman; two years later AJ McCarron took over and RB Trent Richardson earned a trip to New York. With a new QB in Tuscaloosa once again, expect the Crimson Tide to go back to basics offensively, which means Yeldon should be the featured weapon in Nick Saban’s arsenal. Running for 1,163 yards and 13 TDs — both better than his freshman numbers — those stats should be more in line than what Ingram posted (1,658 yards and 17 scores) when he won. A major figure in this season’s race up until the loss to Oklahoma State on Nov. 23, Petty ranks second in FBS in pass efficiency (179.2) and seventh in passing yards (3,844). The numbers will most certainly be there again in ’14, and with the Bears returning all 11 starters on offense, they should be in the playoff conversation. But maybe the biggest thing playing in Petty’s favor next season is that he had even his monster junior year. A relative unknown this summer, he’ll now be on everyone’s radar. In the pecking order of dual-threat QBs, which have won the past four years in Winston, Johnny Manziel, Robert Griffin III and Cam Newton, Hundley ranks behind Mariota and Miller on this list. But Hundley, who threw for 2845 yards, 22 TDs to nine INTs and ran for another 587 yards and nine scores in ’13, could see his stock rise along with that of the Bruins. UCLA played 18 true freshmen this season, more than any other team from the major conferences, which included two along the offensive line. That gained experience will pay off if Hundley returns and make the Bruins playoff contenders, only amplifying his campaign. Averaging 115 yard of offense, Johnson’s sophomore season was cut short with a broken ankle suffered in the Nov. 2 loss to Florida State. But before the setback he showed glimpses of an attribute that will prove crucial as he had five games of at least 19 carries. The Hurricanes will be leaning on him with Stephen Morris off to the NFL, and while it remains to be seen if Johnson can make it through a season of 25-30 carry workload a game, he will be the center piece of the Miami offense in ’14. We could be in for an intriguing battle in the state of Florida next season with Johnson, Winston and UCF’s Blake Bortles. He fell off after an opening seven games in which he ran for 1,012 yards and averaged 9.45 yards per carry. But Gordon is also sharing space in the Badgers backfield with James White (1,337 yards). Without White, Gordon could see a major uptick in carries, though if he returns he’d be pushed by RB Corey Clement, who ran for 515 yards on 66 carries as a freshman. Regardless, Gordon would certainly see the bulk of the attempts — which he didn’t get in his first two seasons — and it could result in a situation similar to ’11 when Montee Ball had 166 more attempts than any other Badger and wound up finishing fourth in that year’s voting. New QB Hutson Mason has looked strong so far, but without the record-setting Aaron Murray, Gurley becomes the poster boy of the Bulldogs offense and his numbers should reflect that. He would be higher on this list, but a lack of consistency and injury were problems this fall. He ran for over 100 yards four times and sat out three games with a sprained ankle. If he puts off the NFL, Bortles won’t lack for cachet after leading the Golden Knights to their first BCS game. Because he plays in the ACC, Bortles would seem to be playing from behind like another star from that league who slipped away in the Heisman race in Louisville’s Teddy Bridgewater. But the Golden Knights have a schedule that would allow Bortles to be a real contender. They have non-league games against Penn State (in Dublin, Ireland) and Missouri, both of which should be Top 25 teams, along with BYU. If he takes advantage of the spotlight games and his production is similar to that of the ’13 season (3,280 yards and 27 total TDs), Bortles will be a factor. It’s hard to peg the next redshirt freshman to make a run at the award, but given Browne’s credentials — he was Scout.com’s top-rated QB in the Class of 2013 and No. 8 overall — and the offense new coach Steve Sarkisian is bringing with him, Browne’s star should rise. He’ll have to beat out incumbent starter Cody Kessler and Max Wittek, both redshirt sophomores, but neither has been overly effective. That opens the door to Browne, especially when you consider Sarkisian’s up-tempo, no-huddle scheme will be similar to what Browne ran at Skyline High School (Sammamish, Wash.) when he was the Gatorade National Player of the Year.